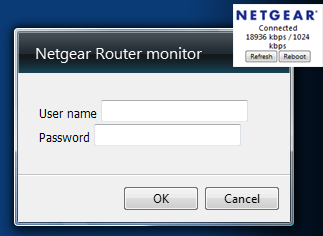 This is a status monitor for a Netgear router, suitable for the Windows Vista sidebar. It's a simplified version of a Mac widget which I found on the Web (Web archive link, the main site is down at the time of writing). It provides monitoring of the upstream and downstream speed, with the ability to reboot if required. Settings dialog. Your password is stored locally using the Gadget API.